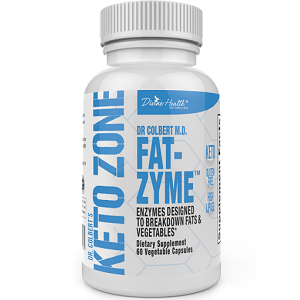 If you’re on the ketogenic diet and need added support to improve or accelerate your weight loss results, this review of Keto Zone Fat-Zyme is for you. Divine Health has formulated a product which it says will support you in your weight loss efforts and is meant to help you if you’re already adhering to a keto eating plan. It is therefore not a keto replacement, but a compliment to the high fat, low carb eating patterns you’ve already put in place. Divine Health says that the digestive enzymes and good gut bacteria in its formula are meant to help with protein and sugar digestion and restore healthy gastrointestinal functioning. They should also improve nutrient uptake into the body and minimize nutritional deficiencies. It is clear from the ingredients that the product is formulated to break down fats (lipase), sugars (beta glucanase, xylanase, amylase) and proteins (pectinase) specifically. There are also several god bacteria added which create an enabling environment in the gut to further facilitate food breakdown. This supplement comes in capsule form. Take 2 Keto Zone Fat-Zyme capsules per day. Have the first one half an hour before breakfast, and the other half and hour before dinner. There are no listed side effects as the supplement consists of natural enzymes and also good bacteria to aid digestion. Keep in mind though that the enzyme lipase can cause digestive upset including but not limited to nausea, diarrhea and cramping. It should not last more than a few days. If it persists, you should consult your doctor. On the whole, lipase is largely safe to use and these side effects should be minor, not last long and not affect most people. Get doctor clearance to use this supplement if you are pregnant or breastfeeding. Each bottle contains 60 capsules. This will give you one month’s worth of Keto Zone Fat-Zyme. It sells for $29.99 on the product website. There do not appear to be bulk discounts. A thirty-day returns policy is in place. However you will only qualify for a full return should you send back unopened bottles in their original packaging. This means you have no way of testing the product to see if it works for you. The product should help to optimize healthy digestive functioning and go a long way to restoring good gut bacteria. If the gastrointestinal flora is not well balanced or overrun with bad bacteria to begin with, this impedes the working of enzymes. As the bottle contains a one-month supply of tablets, it is slightly more expensive than other similar enzyme-based supplements. The product is what it says – and aid and not a replacement. As such, it does not contain any fat-burning ketones. If you’re looking for either exogenous or internal ketones to increase your metabolism this way, this isn’t the product for you. However, healthy digestion goes a long way towards weight loss as food is encouraged to exit the body quickly, while the necessary nutrients are absorbed. It would have helped if the manufacturer had been more transparent regarding the precise working of each ingredient, not merely the overall purported effect. On the product website, the supplement receives only rave consumer reviews but we couldn’t not find enough evidence of similar, independent consumer reviews. We are further hesitant to recommend this product because the returns policy is weak – you cannot return any opened bottles. John Parker	reviewed Divine Health Keto Zone Fat-Zyme	on February 13th	 and gave it a rating of 3.